Wishtel has launched another in budget tablet called IRA Thing 2 E. With this tablet, the company has expanded its tablet market range in India. They have already launched the first part of IRA Thing E in march, which runs on Android 2.2 Froyo. And this new tablet called IRA Thing 2 E will run on Android 4.0 ICS and is completely in budget too. Getting into the technical specs of IRA Thing 2 E, it is really amazing to get a tablet PC at the price range. The tablet is manufactured by Wishtel Pvt Ltd, and is located in Mumbai (India). To check out the price, order page and other specs, you can continue reading this post. IRA Thing 2 E comes with Android 4.0 Ice Cream Sandwich Operating System. and has an amazing 7 inch WGA wide screen. Lets check out some key specifications of this tablet below. Wishtel claims that IRA Thing 2 E can offer Indian language to support 14 different languages like Hindi, Gujarati, Bengali, Tamil and etc. This tablet is pre-loaded with several TV and e-news apps, which gives you access to over 120 channels and 50+ News papers. Touch Panel: TFT Liquid Crystal Capacitive 5 point multi touch. I/O Port: mini USB, mini HDMI, micro SD, earphone, DC jack. Office Software: Office word, excel, Power point Files- Read and Edit and also support PDF browsing. Features and Apps: Android app market, Browser, Media Player, Photo Viewer, MSN, Skype, IREAD, GAME, Open Office, Open browser, and has option to download any other app or browsers from Android market (Google Play). Language: Supports multiple languages and 14 Indian languages. IRA Thing 2 E General Applications: GTalk, Play Store, Office Suite, Multi Language. TV, Movies, News Papers, Skype Video Calling, Adobe flash player and PDF. IRA Thing 2 E Accessories: USB Cable, Stereo earphone, Protective Pouch, Power Adapter, User Manual. These are the technical and general specifications of IRA Thing 2 E tablet. This tablet is open for online booking and is completely under budget. The company has only few limited distributors all over the India. People in the north side of India might be able to get their hands on this tablets very quick, when compared to south Indian customers. You can buy this tablet and apply online below. 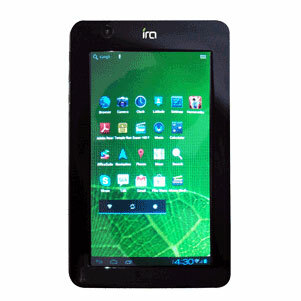 Click here to Order your IRA Thing 2 E Tablet. Else you can also call the Wishtel Customer Support below. If you have any queries on this amazing budget tablet PC, just leave us a comment below. We will answer you as soon as possible. Technical specifications are pretty good and the cost is also very reasonable compared to other tabs with same configuration. After reading specification of this tablet It seems to be appealing. I can only one drawback…its camera resolution 1.3 although I was expecting slightly more than that ……but it price are quite reasonable…. Recently I have purchased IRA Thing2 Tab online. But Iam unable to view ms word documents from pen drive. The instructions booklet is not clear and complete. How to view microsoft word documents and how to edit from my Tab. Plz guide me. You will need a document editor app, get one from the app store then you will be able to edit documents. I want to writ, edit and save documets in tamil language and also to copy them in the pendrive. So which tablet pc I should buy and what is the further procedure ? Please help me. The tablet won’t make a difference, if you’re going for an Android, check out if there’s an app that can do what you want. 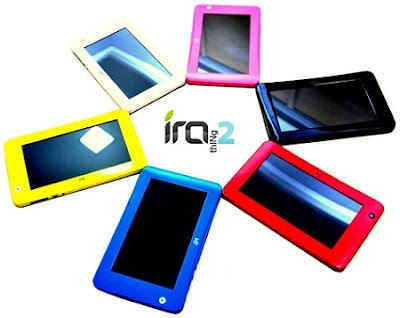 Sir i have ira thing 2 tablet , i want it should be also run on 2g network, pleaze give me suggestion. You can select maximum network speed from the Network settings.